Where we eat, what we eat and even how we eat is a reflection of our place in the world. While that sounds grand, you'll find it's true if you look close enough. That might be as simple as "I like this salted butter... what else can butter do?" Or it might be as demanding as "I want the taste and mouthfeel of meat... without eating meat." And of course, food trends reflect world and cultural events, as well as market demands. A combination of environmental concerns and innovations in food science has led to a changing attitude to meat. If even for one day a week, more foodies are opting to go meat-free and experiment with plant-based protein. Technology has played its part too, as plant-based burger patties are starting to match the texture, juciness and umami taste that beef has to offer. This is due - in some cases - to artificially reproduced "heme" (pronounced "heem"), which recreates the taste of iron that makes burgers so tempting. One of the most notable meat substitutes which is really starting to gain popularity of late is jackfruit. This fruit native to India is loved for its meaty texture - often used as a replacement for pulled pork - and its sustainability; a single jackfruit tree can produce 100-200 fruits per year. These meat-free, plant-based burgers are passing the customer taste test and are already sprouting up (pun intended) in restaurants in cities around the world, most notably America. Like many food trends, the "plant based protein" craze is being driven by millennials, 80% of whom eat meat alternatives. The other drivers of food trends - chefs - are getting in on it too. More and more chefs are experimenting on making traditional meals without meat (meat-free Indian cuisine is a hot property, for instance). And veganism, once a fringe pursuit, is edging further to the mainstream. Expect to see more vegetables and plant-based protein innovations on restaurant menus throughout the year, and expect to love it. Another reflection of experimentation and consumer demand, chefs and food companies are making unusual substitutions in familiar food. In recent times you might have tried brown bread ice-cream, chickpea crisps or courgette-spaghetti (courgetti). Sometimes this is to create fun and zesty combinations, but more often, its a case of substituing a healthy element for an unhealthy one, allowing the diner to enjoy the taste without the guilt. One example, rising in popularity, is pizza with a base made from cauliflower instead of dough. Foodies are also trying Legume Pasta, which is made from foods like split peas, red lentils, black beans or chickpeas. Taste wise, results have been mixed, but there are some very smart, highly creative chefs and scientists working on these food swaps, suggesting that the best is still yet to come. One of the most wonderful things about food is that there's always something new to discover. You could spend years trying every dish in the world, and the time you're finished, a lifetime of new meals and variations will have emerged. For instance, Europeans are only now enjoying West African cuisine in serious numbers. This newly found love for the region's cooking is down to a range of factors: Many of West Africa's heartiest dishes (such as jollof rice and chicken yassa) are cooked in one pot, which dovetails nicely with the one-pot and slow cooking trends. Also, West African food often uses ingredients that are growing in popularity in savoury meals, like peanuts, plantains and ginger. If you see grilled tilapia and gingery Scotch bonnet stew in your local restaurant next year - and you well might - your journey to West African cuisine is underway. 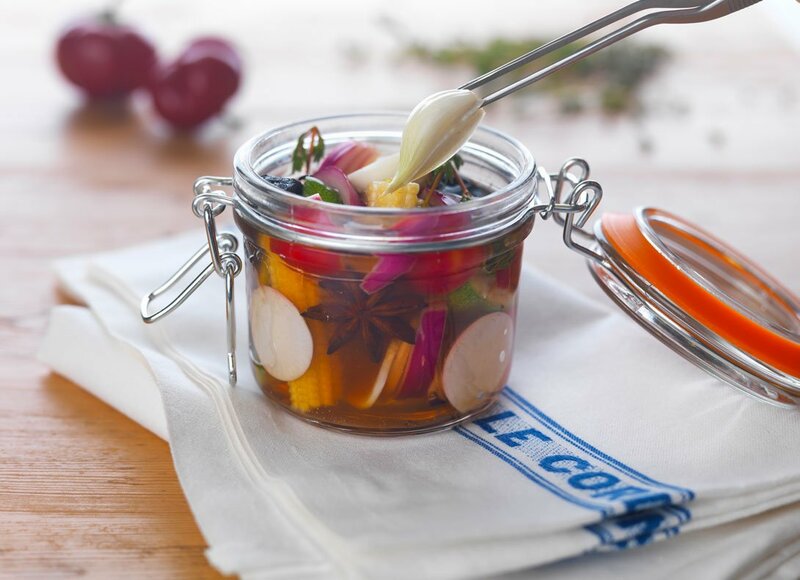 We recently talked about the influence of pickling and fermenting, a practice that has spread from France to the rest of the world. The health benefits of some of these foods is now becoming evident, and consequently, foodies are flocking to them. A number of popular fermented foods are beneficial to one's gut, and you've probably tried them; kimchi, kefir and miso for example. Food that's been fermented effectively promotes the life cycle of good bacteria, making for healthy, long-lasting food. Fermentation is a centuries-old food preparation process used to make everything from chocolate to yoghurt to tea. Famously fermented foods like saurekraut and kimchi are becoming more ubiquitous with more - we expect - coming to a jar or plate near you. Any chef will tell you that not all butters are created equal. And the craft butter revolution is just getting started. This can be viewed in two strands. Firstly, there's the richer variations of butter you'll be seeing on more restaurant tables and tasting in their dishes. "Cultured" butter, with good bacteria (lactobacillus), and rock-salt hand-kneaded into it, is already making inroads in some London restaurants. More variations are on the horizon and we predict they will becoming welcome guests at brunches around the world. The second strand is the continued evolution of nut and seed-based butter. Emerging recently, unusual butter spreads that use sunflower seeds, pumpkin seeds, hazlenuts and cashews are the toast of the town. Perhaps the most consistent driver of food innovation is passion, and indeed, that is the quality we value the most in our students. A love of good food and drink, and the discipline that follows are the ingredients that make great chefs, entrepreneurs, hospitality managers and wine merchants. Find out more about starting a career in the culinary arts at Le Cordon Bleu London.